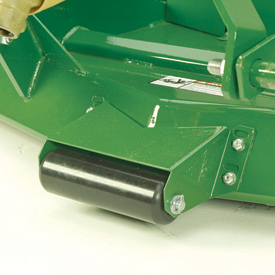 Anti-scalping rollers are mounted to the front of each cutting deck on the FM20 and FM21 Series Flex-Wing Grooming Mowers. The FM20 and FM21 Series Flex-Wing Grooming Mowers have completely independent free-floating mowing decks that provide a perfect cut on uneven terrain. 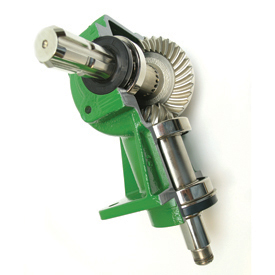 The rugged gearbox on the FM Series Flex-Wing Grooming Mowers features spiral gears to dramatically reduce noise, increase endurance, and transfer more power to the blades. The pneumatic tires on the FM20 and FM21 Series Flex-Wing Grooming Mowers put less pressure on the ground, making them ideal for use on golf courses and sport fields. The telescoping wings on the FM20 and FM21 Series Flex-Wing Grooming Mowers allow for adjustable cutting widths to increase or decrease mower overlap for slope applications. 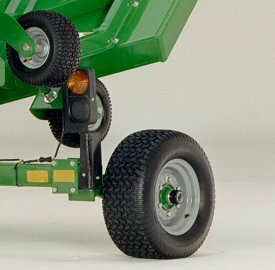 For added safety, the transport latching mechanism on the FM Series Flex-Wing Grooming Mower automatically engages when the decks are raised into the transport position. 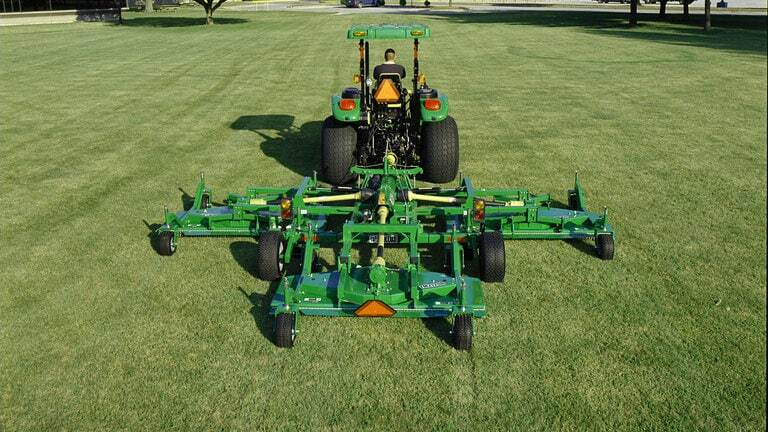 The optional floating hitch is for undulating terrain, providing increased flexibility and mowing results. 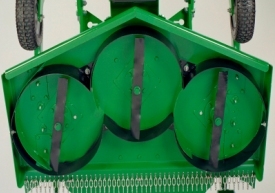 A mulching kit is available as an attachment for field conversion. 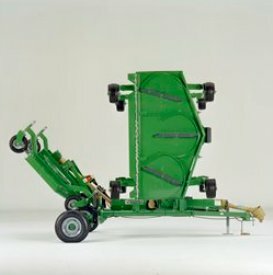 The mulching kit includes unique mulching blades, baffles, and guard supports to produce smaller clippings, which decompose faster than clippings that haven't been mulched. 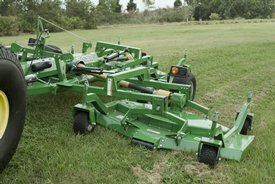 Operators should follow the one-third rule for cutting height when mulching in grass. This mulching kit also does an excellent job when mulching leaves. 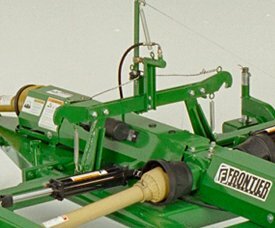 The hydraulic unlock system field conversion kit is available for FM20 and FM21 Series Flex-Wing Grooming Mowers. 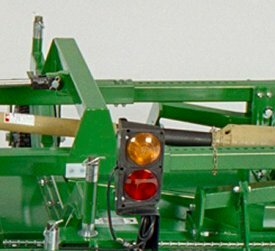 This conversion kit allows the operator to unlock the wings from the tractor seat with the convenience of a hydraulic lever. 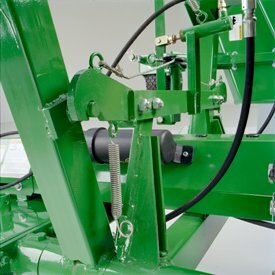 It replaces the standard rope disengagement that comes with the flex-wing mower. 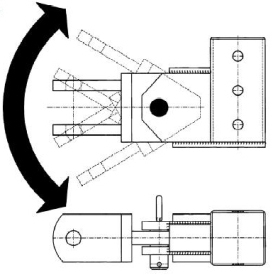 The hydraulic unlock system requires one additional selective control valve (SCV) (two total) and is ideal for lawn services that fold and unfold the unit to go from job to job.